got a great recipe to share? don't be a wallflower! jump to the discussion boards ..
Quite possibly my favorite ravioli filling ... the creamy sweetness of the squash doesn't need any fancy sauce, in my opinion; just toss with a little bit of butter, add some fresh ground pepper and grated parmesan -- perfection. If you want to get a little fancier, brown the butter in a skillet for a couple of minutes, and add some fresh sage. Note: If you've got leftover squash filling, use it to make butternut squash soup the next day. Just add some soup stock, season with cayenne pepper and puree till creamy smooth. 2. Cook the butternut squash: slice the squash in half, and scoop out the seeds. Place both halves cut-face down in 1/4" of water, in a large roasting pan. Bake at 375F for 40 minutes or until tender. 3. Scoop out the cooked squash and mash well using a fork or potato masher. Add butter, nutmeg and cinnamon. Sprinkle salt and sugar to taste. Let cool. Refrigerate for up to a day, or use immediately. 4. Cook in boiling water for 5-7 minutes (exact cooking time will vary, depending upon how large/thick you've made your ravioli). 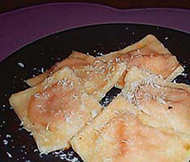 Toss with butter and pepper; sprinkle with parmesan and serve. check out the recipe index !